In the mid-1990s, University of Oregon President Dave Frohnmayer needed money to save his school. Alum and Nike chief executive Phil Knight was happy to help—as long as the university could be managed in a way that would maximize the company's brand and profits. But when Frohnmayer made a key misstep, Knight exacted a brutal punishment. When Dave Frohnmayer took over as president of the University of Oregon in 1994, the school was in dire need of funding. A piece of state legislation known as Ballot Measure 5, which was narrowly passed by Oregon voters in 1990, severely cut the property-tax revenues that Oregon schools relied on for most of the state funding they received. Oregon&apos;s K-12 schools were effectively pitted against the state&apos;s public universities by the tax cuts, which forced educators from both groups to compete for support from the same general fund. Frohnmayer knew that the university would need to look elsewhere for funding if it were to survive. In an address to his faculty in October of 1994, he suggested that survival was imperative. “Our research universities made the United States the technological and scientific leader of the world,” Frohnmayer said. “On a more jarring note of reality, they helped win the Cold War. Our humanists, artists, and professional scholars add discipline and understanding to every endeavor of value.” A state&apos;s public universities also carried a burden of public service, he argued, because the students they educated and the research they performed were inextricably linked with the success of the state and society. The work done at the University of Oregon must be shared, he said, not only because it was the societal duty of a public institution, but also because any region that did not nurture a major research university in its midst was, in his view, a region that would "doom itself and its people to economic servitude." University of Nike: How Corporate Cash Bought American Higher Education. Economic servitude was, by then, more than an abstract fear for an increasing number of Oregon high school graduates who could no longer afford tuition at their state&apos;s flagship university—in the years since Measure 5 took effect, the University of Oregon had raised in-state tuition by more than 60 percent, and applications from graduates of Oregon high schools subsequently dropped by several thousand. Things were only going to get worse: Governor John Kitzhaber&apos;s budget proposal for 1995 called for a 14.4-percent decline in state support for higher education, making Oregon the only state in America to send its legislature a proposal asking for less money to support its public universities and colleges. Disinvestment in higher education was, in essence, a matter of policy in Oregon. In the face of this, Frohnmayer told his faculty and administrators, they must reconsider the University of Oregon&apos;s funding model. "We must raise more outside money," he said. But small donations from alumni and local business owners wouldn&apos;t be enough to stanch the bleeding caused by five years of Measure 5 cuts. With deeper cuts still to come, Frohnmayer knew he needed to court a different class of donor if he wanted to do more than tread water—the kind of donor who could afford to give more than a few million dollars once or twice a decade. In January of 1995, as the Oregon Ducks headed to the Rose Bowl for the first time in 37 years, Frohnmayer began to consider football as a potential saving grace. Broadcast rights and ticket sales could help the school raise short-term cash, and making the program more competitive might attract the one corporate benefactor within the president&apos;s reach: Nike. Phil Knight, Nike&apos;s founder and a University of Oregon alum, bought his own suite at the university&apos;s Autzen Stadium in 1991, but the steady chaos of Nike&apos;s ascent often kept him from enjoying it. When the Ducks reached the Rose Bowl in 1995, Knight took notice, and even caught himself thinking about how much he&apos;d like the team to do it again in his lifetime. Knight presented his first major gift to the University of Oregon in the midst of the football team&apos;s turnaround 1994 season: $27.4 million to renovate and expand a library that was rechristened in his honor. Knight&apos;s philanthropy put him in close touch with Frohnmayer, and with the football team&apos;s new coach, Mike Bellotti. Rich Brooks, who had led the Ducks to their first Rose Bowl in 37 years, was rewarded with an NFL job as head coach of the St. Louis Rams, which led to considerable anxiety about whether Oregon could repeat its miracle &apos;94–&apos;95 season. Knight made better use of his Autzen Stadium suite during Bellotti&apos;s first year at the helm, which was successful enough to end with a trip to the Cotton Bowl, where the Ducks lost to Colorado, 38–66. The day after Oregon&apos;s drubbing in the Cotton Bowl, Knight met for drinks with Bellotti and his offensive coordinator. "What would it take to get to the next level?" Knight asked Bellotti. "Well," the Ducks head coach said, "if we had an indoor facility that we could use to practice in the fall, we could raise ourselves considerably." Knight told Bellotti he might be able to find a way to help him. The Nike billionaire&apos;s interest was professional as well as personal: The apparel giant&apos;s top spokesman, Michael Jordan, had abruptly retired from professional basketball ahead of the 1993–&apos;94 season, and it was unclear how deeply Nike might feel the loss of its most iconic athlete. Efforts to outfit NFL teams were stepped up, and followed the strategy that helped Nike gain a dominant position as a sponsor of NBA athletes: outfit college teams, develop new shoes and apparel for them, and aggressively brand and market the results to ordinary sports fans. Access to college football programs would be a boon for Nike&apos;s research-and-development department, while access to the student body would offer affordable, unprecedented advertising possibilities. Long before fundraising became a professional imperative for Frohnmayer, it had been a deeply personal one. His children suffered from a rare and fatal disease called Fanconi anemia. When his eldest daughter Kristen was first diagnosed in the early 1980s, doctors told Frohnmayer and his wife, Lynn, that it would kill her before she turned 20. Even worse, it was a genetic disorder, so the Frohnmayers needed to bring their two other children in for testing as well. Katie, who was four, was given the same diagnosis as her older sister, while her brother Mark tested negative for the disease. When Lynn became pregnant again in 1986, the genetic math said her new child, like the rest of Dave and Lynn&apos;s children, would have a one-in-four chance of being born with FA, which is so rare that it typically afflicts just one child out of every 350,000 births. The disease results from a genetic defect in a cluster of proteins responsible for repairing DNA, which leads most sufferers to die after developing some form of cancer, often leukemia. Ninety percent of all FA patients would develop bone marrow failure before the age of 40, though few lived that long; 50 percent didn&apos;t reach the age of 10, and most of the rest were dead before they were 20. In 1985, feeling "isolated and alone," Dave and Lynn decided to start a support group for the parents of children with FA. They penned an open letter and asked an FA researcher to forward it to the families listed in his private registry. Responses came from 19 different families, which became the basis of a newsletter the Frohnmayer family began sending out with the latest information on the disease. The mailing list quickly grew to dozens of families, then hundreds, from nearly every state in America and 21 foreign countries. In 1989, they registered the Fanconi Anemia Research Fund as a non-profit organization, realizing that it had become much more than a support group for grieving families. Gradually, the focus had shifted from coping with FA to raising much-needed money to fund grants for the small number of scientific researchers who dedicated themselves to learning more about the disease and investigating treatments. In its first five years as a non-proft, the group was able to fund 15 grants for researchers studying FA, making the Frohnmayers the foremost backers of global efforts to isolate the gene responsible for the disease. The Frohnmayers did their best to let their children lead normal lives. Kirsten was elected freshman class president at South Eugene High School, while Katie learned to play the piano and celebrated her ninth birthday with a slumber party. Kirsten was pathologically determined to lead a normal, productive life, often reminding herself that "a lot of people have bad things happen to them." But the truth was that her condition was dire, and worsening every day. Her blood counts eventually sank so low that Lynn and Dave took her to Harvard Medical School to explore a radical treatment that other doctors had advised against. It involved treating Kristen with a male hormone called oxymethalone, and it was particularly controversial because Kirsten was 13, which meant she would be taking male hormones while going through puberty. "It was a horrible thing to do, but we felt that our backs were completely against the wall," Lynn said. Kirsten&apos;s bravery was rewarded when her blood counts improved as a result of the treatment, and they remained steady as long as she continued taking the hormones. At the same time, her younger sister Katie began showing her first serious symptoms. Dave and Lynn responded by doubling down on their efforts with the FA group they&apos;d founded. 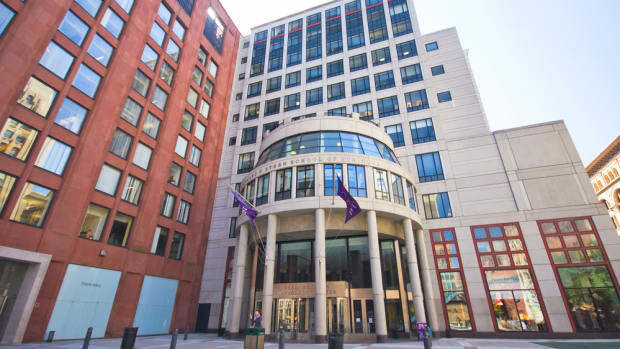 In 1988, they raised $550,000 for Dr. Arleen Auerbach, a geneticist at Rockefeller University, and the following year they assembled a formal review board to assess the value of the research being proposed by each potential grantee who approached them. It soon became clear that significant advances in medical research would be Kirsten&apos;s and Katie&apos;s only hope for survival. Advances in gene therapy showed promise, but research required money. Dave put more of his time and effort into fundraising, not only from foundations but from corporate donors. He and Lynn began to gain traction, but learned early on not to let their hope grow into full-blown optimism. Another setback was always around the corner. A few weeks after their third daughter Amy was born, Lynn got a call from the family&apos;s pediatrician. The blood sample they&apos;d taken from Amy had clotted, he said, so they&apos;d need another one. "I already knew the real reason they wanted a retest," Lynn said. "Mother&apos;s intuition." Amy&apos;s prenatal test had produced a false negative. Suddenly they had a third daughter suffering with FA. In the late 1980s, Katie began complaining of pains in her side, which ultimately led to an operation to remove her spleen. In just over a year, she was hospitalized 18 times with a host of new symptoms, including a narrowing of the carotid artery, which caused her to have a stroke in June of 1990. Katie&apos;s stroke prompted doctors to begin a new course of treatment using gamma globulin injections, which revitalized her enough that she was able to join the family for a summer skiing trip to Utah in 1991. But she began experiencing shortness of breath after taking a ski lift to the top of a mountain to enjoy the view with her father, and a few days later her sister Kirsten found her on the floor in their hotel room, unable to move half her body after suffering a second stroke. She spent a month in a hospital in Salt Lake City, unable to speak or move. "She was trapped inside," Frohnmayer said. "But she could still blink and she could smile." Months earlier, after suffering her first stroke, Katie had grown reflective, as though she knew she was going to die soon. After she lost her ability to speak, Lynn recalled conversations during which her young daughter had prepared her for what was to come. "Mom, I&apos;m just so glad that I have had these years," she said to Lynn. On September 26th, 1991, Katie died at a hospital in Eugene. She was 12 years old. Just weeks later, her sister Kirsten started school at Stanford University, and, a short while after that, the first FA gene was identified by one of the research teams the Frohnmayers had helped fund. Before Katie&apos;s funeral, Dave gave the pastor strict instructions that forbid him from making any statements that might imply Katie&apos;s death had been some part of God&apos;s plan. "It&apos;s not a time for comfort," he said. "It&apos;s an occasion of deep anger that this thing should be visited upon our child. If there is a God, why should this happen?" After Coach Bellotti told Knight that he needed an indoor practice facility to convince top high school prospects to come play ball in rainy Oregon rather than sunny California, Knight committed to giving the school $8 million to help build it. When the 117,000-square-foot Moshofsky Center opened less than two years later, it made the University of Oregon the only school on the West Coast with its own indoor practice facility. The sparkling edifice featured a full-length artificial field with ceilings that reached 70 feet high at their tallest point. Four lanes of synthetic indoor running track stretched 120 meters across an area adjacent to its football field. There was even an indoor retail outlet for selling Oregon Ducks merchandise and apparel. The Nike chief executive also found creative ways of ensuring that his dealings with the public university were handled like private business deals. "In higher education you have more hoops to jump through and policies, you can&apos;t move as fast as corporate America," said Bill Moos, Oregon&apos;s athletic director. This proved to be a constant source of frustration for Knight. He could attribute much of his success as a businessman to finding ways of coloring outside the lines—Nike had circumvented U.S. minimum-wage laws by using factories based in countries where wages were much lower; it avoided paying international tariffs on some of the foreign-made shoes it then imported back to the U.S. by classifying them as slippers rather than shoes; and it had end-run its own partners through corporate espionage and cutting secret deals on the side. Knight did things "the Nike way" in his dealings with the University of Oregon as well. When giving the school money for a building or athletic facility, Knight circumvented many of the processes public universities are expected to go through with such undertakings. Instead of handing over the money to the school, for instance, Knight often took charge himself. He opened limited-liability corporations controlled by himself and his wife, Penny Knight, using names like “Penny and I, LLC” or “PHIGHT, LLC.” Through the relevant LLC, Knight would pay for the design of the building, lease the land it would go on from the university, and then proceed with construction on his own. Once completed, the facility would be handed back to the school as a finished product, having relieved it of responsibilities like a public bidding process with construction firms, negotiations with union laborers, and an open dialogue with the campus community and other Eugene stakeholders. This proved to be an endless source of frustration for labor unions like UA Local 290 Plumbers and Steamfitters, which claimed that the university prevented scrutiny of Knight&apos;s projects by blocking access to records that were supposed to be public. By the end of 1996, it was clear that Knight was precisely the corporate super-booster Frohnmayer had been hoping for when he told his faculty that the school was going to need to embrace change and seek out more private funding. In less than two years, the Nike chief executive had committed to giving some $35 million for various building renovations, athletics facilities, and endowed chairs and professorships. He had also given Oregon&apos;s football team a new look to go along with its new facilities. Throughout the early and mid-&apos;90s, Nike aggressively moved into the fractured market for college athletics apparel, which was helping the company rake in an extra $50 million each year by the end of 1995. College athletics promised more room for growth than the nearly saturated market for professional sports apparel. It also gave Nike the chance to expand its influence in the world of college football. As part of its $6.2 million deal with Florida State University, Nike agreed to pay $225,000 per year to head football coach Bobby Bowden, on top of his salary. The company inked a six-year, $8 million deal with the University of Michigan and paid Penn State University $2.6 million over three years. Nike also signed North Carolina, Miami, Colorado, Southern Cal, and Illinois, but the most enduring of its all-school deals proved to be the one Knight cut with the Oregon Ducks, who took to the gridiron in 1996 wearing a simple green-and-yellow jersey, with Nike&apos;s swoosh logo printed on the left shoulder. Soon, Nike&apos;s research-and-development unit would use the University of Oregon as a testing ground for developing new football gear it might later sell to other schools and to NFL teams. By the end of the year, the company&apos;s U.S. apparel sales had risen by 99 percent, and Knight attributed this largely to "getting our apparel products on the playing fields of the world." It was, Knight said, the year that Nike moved past being a shoe company or even a shoe and apparel company, and instead became "a total brand." The company was flush with cash and eager to get its gear on more soccer players in Europe and more college football players in the U.S., both of which Knight saw as central to keeping Nike in the realm of the "total brand." But in 1998, Nike&apos;s tailwind was suddenly slowed by a major financial crisis in Asia, where demand for Nike products dried up almost overnight. As orders were canceled throughout the troubled region, Nike slashed retail prices in the U.S. in a desperate bid to unload its massive inventory surplus. Profits plummeted and Nike laid off hundreds of workers overseas and hundreds more at its Beaverton headquarters, where it had already lost five of its most important executives to retirement and resignation. Worst of all, Knight&apos;s company was suffering a public-relations crisis unlike anything it had faced before as media reports revealed the unsettling conditions Nike&apos;s overseas laborers were working in, and the meager wages they were being paid to do so. Despite the setbacks Nike was facing, Knight continued to invest in the University of Oregon, where he committed to spending another $30 million on a renovation that would expand the number of seats at Autzen Stadium in Eugene. He also made a much smaller, more unusual investment at the school, which went largely unnoticed. On top of endowing professorships, Knight began personally contributing $40,000 toward President Dave Frohnmayer&apos;s annual salary through a supplemental payment approved by the board of higher education. Behind the scenes, the Nike chief executive quietly invested himself even more deeply, and more personally, in Frohnmayer&apos;s affairs by becoming the Fanconi Anemia Research Fund&apos;s single largest donor with an annual gift of $1 million. This gave Knight an unusual amount of leverage over the University of Oregon and its president, particularly in light of the Frohnmayer family&apos;s most recent tragedy. Just days after Frohnmayer returned home from Pasadena following the Ducks&apos; devastating loss in the 1995 Rose Bowl, his oldest daughter, Kirsten, noticed a bruise that she couldn&apos;t explain. A blood test revealed values consistent with leukemia, which was especially tragic because it disqualified her from participating in clinical trials for a gene-replacement therapy that doctors at the National Institutes of Health hoped might end FA by making it possible to replace the defective inherited gene with one that does not have the defect. In February of 1995, Kirsten traveled to the University of Minnesota for a bone-marrow transplant, which was considered a long shot since the donor was not a close relative. Miraculously, the transplant seemed to be a success, and Kirsten was well in time to attend her graduation ceremony at Stanford. Then, late in the summer of 1995, her leukemia returned. Increasingly desperate for a remedy, Lynn brought her daughter to Milan, Italy, for an experimental treatment in which doctors administered genetically altered T cells—a treatment that was not yet approved in the United States. Her leukemia went into remission, briefly, but returned in April of 1996. On June 20th, 1997, Kirsten Frohnmayer died of complications from FA at the same Eugene hospital where her younger sister had died. She was 24. Amy, who was 10, was suddenly the only daughter Dave and Lynn had left. And Phil Knight&apos;s money was the only thing that seemed like it might save her. The shoes that Nguyen Ti Tu Phuong died making were designed at Nike&apos;s headquarters in Beaverton, Oregon. The plans for the shoes were then relayed by satellite to a computer-aided manufacturing desk in Taiwan, where prototypes were developed and tested. Once the shoe&apos;s blueprints were approved, they were sent by fax to the factory where Phuong worked, in Bien Hoa, northeast of Ho Chi Minh City in Vietnam. There the shoe&apos;s three main parts—the outsole, the midsole, and the upper—were produced individually, then assembled in a labor-intensive process that was difficult to automate, and therefore relied on manual labor. It was a summer day in 1997 and Phuong was making midsoles, carefully trimming away the excess synthetic material overflowing from molds that had just come out of an oven. Nearby, a co-worker&apos;s sewing machine suddenly broke down, spraying metal parts across the factory floor. A piece of shrapnel pierced Phuong&apos;s heart, killing her instantly. She was 23. Nike&apos;s response to the young woman&apos;s death was to boldly claim: "We don&apos;t make shoes." Knight and his team of self-proclaimed "shoe dogs" now claimed they were little more than the designers and marketers of shoes made by other companies. The backlash against Nike amplified just as the company was expanding its retail operations by opening its upscale Niketown retail outlets around the country. Picketers and news cameras showed up at store openings, including one in San Francisco, where NFL wide receiver Jerry Rice was assailed with questions about sweatshops and child labor. This was a major problem for Knight, who planned to open three more Niketown shops in 1998; they weren&apos;t just retail outlets, but brand-awareness generators that helped increase Nike&apos;s sales at other retailers, like Foot Locker. And key Niketown locations, like the one in London, would help give the company the foothold it needed as it sought to make inroads into the European soccer market. Michael Jordan faced his own tough questions about Nike sweatshops during a press conference, but even worse things were in store for Knight, who learned that documentary filmmaker Michael Moore was set to release a new film, The Big One, focused on Nike&apos;s misadventures in offshore manufacturing. Wall Street took notice, and throughout 1997 it was not uncommon to find stock analyst reports filled with summaries of the latest news reports on the condition of Nike&apos;s factories throughout Asia, and the extent to which the company and its shareholders were exposed. For the first time in years, analysts began downgrading Nike&apos;s stock and lowering its expectations for the company&apos;s outlook. When Knight at last looked outside his company for help, he turned to a firm called GoodWorks International, owned by Andrew Young, a former mayor of Atlanta who had also been the U.S. ambassador to the United Nations. He hired GoodWorks to evaluate Nike&apos;s operations in 1997, and Young himself went to Asia to meet with some of Nike&apos;s suppliers and contractors there. When Young issued his report on Nike&apos;s use of overseas labor, it was hard to imagine that Nike&apos;s public relations staff could have done more to polish what was clearly a rotten apple. Knight was so pleased with Young&apos;s conclusions that he took out full-page newspaper advertisements highlighting them. "It is my sincere belief that Nike is doing a good job," one advertisement in the New York Times read. "But Nike can and should do better." Knight was also pleased with another aspect of Young&apos;s evaluation: while third-party monitoring of Nike&apos;s overseas factories was a good idea, it should be left to a company like his own firm, GoodWorks, Young felt, and not to global labor and human rights organizations. The benefits of this approach for Nike were evident from the amount of control the company was able to exert over the Young report, which completely ignored the key issue of wages for factory workers. Young had also relied entirely on Nike interpreters during his 10 days of interviews with the workers making Nike shoes at factories in Asia. The widely criticized Young report was further undermined in November of 1997, when a disgruntled Nike employee leaked some highlights from a series of formal audits Nike had commissioned Ernst & Young to prepare. The accounting firm had, in fact, been auditing Nike factories since 1994, but Knight had managed to keep these less-forgiving assessments quiet up until the leak. The factory where Nguyen Ti Tu Phuong died making Nike shoes, Ernst & Young found, did not have safety equipment or training for its workers, who were forced to work more hours than allowed by law, making them more likely to become injured or killed on the job. For months, Nike had known exactly which measures needed to be taken to prevent others from dying like Phuong had; but instead of focusing on solutions for the problems Ernst & Young had found at its factories in Asia, Nike instead promoted the much rosier portrait that Young had painted in his report, which was conducted the same summer that Phuong died—a picture of a company doing its best and coming up a little short, as even the best athletes sometimes do. On the afternoon of April 4th, 2000, six University of Oregon students locked arms and blocked the entrance to Johnson Hall, a stately 100-year-old building that housed the offices of the school&apos;s top administrators. A heaving mass of protesters came with them, swarming the six stone columns framing the entrance to the redbrick façade, which sits on 295 immaculately kept acres of campus, bordered by the Willamette River and stippled with some 3,000 trees. From the window of his fifth-floor office, Frohnmayer could see the message his students had written to him, spelled out on the sidewalk in bright pink chalk: "TAKE A HIKE NIKE," with the company&apos;s signature swoosh logo standing in for its name. It was the University of Oregon&apos;s first major student sit-in since the anti-war demonstrations that began in 1969 and carried on into the following year, intensifying just as Frohnmayer arrived at the university as a law professor and legal counsel to then-president Robert D. Clark. In many ways, Clark had had it easier than Frohnmayer. Had he sided with protesters and kicked recruiters off his campus, he&apos;d only have angered the U.S. Army. Frohnmayer, on the other hand, had to worry about angering Phil Knight. In the three decades since Frohnmayer had moved to Eugene, the college by the river had grown to become Eugene&apos;s largest employer, with 10,000 Oregonians depending on the school for their livelihood. And in the handful of years since Knight had begun paying for new buildings on campus, he&apos;d become more than just an important booster for Oregon athletics; he was the school&apos;s most important benefactor, which made him, in a sense, the town&apos;s most important benefactor. The rise of his influence coincided with a moment in which student activism was regaining its voice, particularly when it came to labor and human rights issues. And Nike—which was facing intensifying calls for independent monitoring at its overseas factories—had a target on its back. It was a major problem for Knight&apos;s company, which was losing ground to Adidas and couldn&apos;t afford to give up its position as the shoe and apparel supplier to America&apos;s top universities. Nike&apos;s war to maintain its grip on America&apos;s college campuses began in earnest late in 1997, when students at the University of North Carolina protested the company&apos;s $7.2 million endorsement deal with the school. In early 1998, the movement gained a powerful voice in Jim Keady, an assistant soccer coach at St. John&apos;s University, who decided to publicly quit his job rather than wear the Nike gear his school&apos;s contract demanded. "I don&apos;t want to be a billboard for a company that would do these things," Keady said of Nike&apos;s overseas labor practices. In 1999, the pressure on Nike intensified after student activists took over buildings at Duke University, Georgetown University, the University of Michigan, and the University of Wisconsin, and staged sit-ins at many other schools. Just before Christmas in 2000, student carolers strode through the halls of Harvard University&apos;s administrative buildings singing "Away in a Sweatshop." It was becoming more than just an image problem for Nike. When a factory worker was fired by one of Nike&apos;s contractors in Honduras, student activists organized such effective protests that the company was forced to rehire the woman. Nike&apos;s university shoe and apparel contracts became the common battleground shared by activists concerned over issues ranging from sweatshop labor and China trade policy to college athletics, which increasingly took precedence over academic excellence at schools around the country. And it wasn&apos;t just contracts with athletic departments that were under fire. Nike was facing significant backlash over the branded apparel it had so successfully marketed to ordinary university students. "It really is quite sick," said Tom Wheatley, a student and organizer at the University of Wisconsin. "Fourteen-year-old girls are working 100-hour weeks and earning poverty-level wages to make my college T-shirts. That&apos;s unconscionable." At a growing number of campuses around the country, organizations like United Students Against Sweatshops and the Movement for Democracy and Education collaborated with the National Labor Committee and the Worker Rights Consortium. The student-led WRC proved to be especially effective at recruiting universities to the cause, first by protesting and then by lobbying students, faculty, and university presidents to sign its pledge censuring corporations using sweatshop labor to produce athletic apparel and shoes. By April of 2000, the months-old organization had already gained the backing of 45 different universities around the country, which frustrated and angered Knight because joining the WRC meant publicly criticizing Nike for failing to allow, among other things, surprise inspections at the overseas factories where its shoes were made. Knight, meanwhile, was trying to pressure Nike&apos;s partner schools into ignoring the WRC, steering them toward the relatively toothless Fair Labor Association, which had executives from various apparel companies sitting on its board. The campus wars came to a head in April of 2000, when Knight abruptly ended negotiations to renew his company&apos;s sports equipment contract with the University of Michigan—a deal that would have been worth as much as $26 million, making it the largest of its kind up until that point. Michigan&apos;s administrators and athletics department stood firm, issuing an unusually pointed statement aimed at Nike&apos;s retaliatory tactics. "Nike has chosen to strike out at universities committed to finding appropriate ways to safeguard and respect human rights," the school said. Sarah Jacobson made her way through the crowd as Eugene police officers handcuffed the six students who had blocked the entrance to Johnson Hall, the student body vice president and president-elect among them. When Frohnmayer finally left the building, Jacobson, a senior and anti-sweatshop activist, blocked the path police had cleared for him. "We&apos;ve got the votes we need in the faculty senate and we&apos;ve got the support of all these students and more," she said to him. "You might as well sign on to the WRC right now." Frohnmayer had done his best to delay the issue, but by March of 2000, there was no longer any question about what the campus community wanted: a referendum sponsored by the student government yielded a majority vote in support of WRC membership, followed by an affirmative action vote from a committee made up of students, faculty, alumni, and administrators. The faculty senate vote was coming, and early indications were that Jacobson was right about where the votes would fall. A number of faculty members, like biology professor Nathan Tublitz, had actively pressed for the school&apos;s membership in the WRC, and they had the support of more moderate professors. Jim Earl, who led the faculty senate, saw it as a "standard protest issue." "The idea of academics even thinking twice about upsetting a corporation that gave the school money frankly didn&apos;t occur to us," he said. It had occurred to Frohnmayer, who was left with nothing but bad options. As much as he wanted to side firmly with Knight, the situation on campus had deteriorated to the point where he couldn&apos;t even leave his office without having student protesters arrested. The day after his encounter with Jacobson, who police had to remove from his path, Frohnmayer faced more protesters. Six of them were arrested and charged with trespassing, but more showed up the following morning, ready to do it all over again. The local media breathlessly covered the showdown, and national activists descended on Eugene in solidarity. Frohnmayer left town on business, and when he returned, the activists were waiting for him. On April 7th, the sit-in moved from the lawn to the hallway outside the president&apos;s office, and the following morning Frohnmayer and two mediators met with Jacobson and seven other students. One of them was a senior named Melissa Unger, who knew it was only a matter of time before Frohnmayer would be forced to sign on with the WRC. She also knew the terms of that deal still left room for concessions to Nike—concessions that could cost the protesters everything they&apos;d fought for if they were to underestimate Frohnmayer. "We want you to sign on with the WRC for a term of five years," Unger said. Across the table from her, Frohnmayer just smiled. On April 12th, he signed the WRC&apos;s members document, making the University of Oregon "a fully committed member" in the "effort to take a socially responsible stand on sweatshops and child labor," for a term of one year, rather than five. Knight did not appreciate the lengths his friend had gone to in order to seek compromise. He was incensed by the fact that his alma mater had signed on to join the WRC rather than the industry-friendly FLA. He was livid that the school, which had been happy enough to accept tens of millions of dollars that had been generated by Nike&apos;s labor practices, now had the gall to criticize them. And he would be damned if he was going to give them the $30 million he&apos;d pledged for the renovation of Autzen Stadium. In a statement sent to the media on April 24th, Knight said the school had "inserted itself into the new global economy where I make my living. And inserted itself on the wrong side, fumbling a teachable moment." He left no room for doubt about who he felt had quarterbacked that fumble: "Ask University of Oregon President Dave Frohnmayer one question," Knight wrote. "Ask him if he will sign a pledge that all contractors and sub-contractors of the University of Oregon as well as University itself [sic] meet the WRC&apos;s &apos;living wage&apos; provision." Knight was interested in results, not the efforts Frohnmayer had made. And the results were bad enough that, on April 24th, Knight publicly withdrew his outstanding $30 million donation to the University of Oregon. In the six months leading up to the WRC protests, Frohnmayer was recovering from a full cardiac arrest that might have killed him if his heart hadn&apos;t stopped while he was surrounded by doctors at a meeting at the NIH, in Bethesda, Maryland. When he regained consciousness the next day, all he remembered was slipping away during his talk and waking up on a table surrounded by doctors in scrubs and green masks. The first thing he remembered thinking was that he couldn&apos;t die until they&apos;d found a cure for Amy. It was a week before he was breathing on his own and some days after that before he could talk, hoarsely, and with difficulty. He underwent surgery to implant an electronic defibrillator to jumpstart his heart in case he suffered another arrhythmia, and Lynn made him give up the coffee, scotch, and cheap cigars he loved so much. He also exercised more, walking two miles each day, but there was nothing he could do to avoid the stress of the WRC protests, the pressure from Knight, or the strain of fighting to save his daughter&apos;s life. In the days after Knight withdrew his $30 million gift, Frohnmayer and Knight talked personally and "soul-searchingly" about resolving the issue. The best that Frohnmayer could offer was his assurance that he would do his best to see that the university didn&apos;t extend its agreement with the WRC beyond the one-year agreement he&apos;d already signed. This seemed not to be good enough for Knight. As the Frohnmayer&apos;s long-time friend and babysitter, Arthur Golden shared in the good times and the bad. In 2000, there were good and bad times in the Frohnmayer household. Amy Frohnmayer was in the seventh grade during the spring of 2000, 13 years old, with long blond hair and blue eyes. She could play Vivaldi on the violin and loved to run. She exhibited no outward signs of the toxic blood cells coursing through her veins, allowing her parents to practice what Dave sometimes called "functional denial" about the reality of their situation. Unlike her sisters, she managed to reach her teen years without any serious health problems. But Lynn and Dave had already seen how quickly the end could come once the bruising and fainting spells begin. They knew a cure was the only way to make sure their daughter had a long, full life. And thanks to advances in gene therapy, they had reason to hope that a cure might be found in Amy&apos;s lifetime. The first attempt at gene therapy was made in September of 1990, when doctors at the NIH treated a four-year-old Cleveland girl named Ashanthi DeSilva, whose immune system was crippled by genetic disease called adenosine deaminase deficiency, or ADA. It worked well as an experiment in a petri dish, but DeSilva&apos;s treatment led to only a partial correction of the defective gene. Repeated and refined over a period of two years, the girl&apos;s genes were tricked into producing about a quarter of the normal amount of ADA. The problem was an inefficient delivery system for getting corrective genes into the nuclei of thousands or millions of defective cells. Eventually, with more funding for more researchers, scientists found better ways of delivering the corrective genes through viral carriers. The crucial advancements came when private companies began human trials for gene-therapy treatments aimed at diseases like melanoma and hemophilia. These breakthroughs gave the Frohnmayers reason to believe that the disease etched into Amy&apos;s genes, which was barely understood by doctors when she was born, might soon be something they could scrub from her DNA completely. Thanks to research made possible by the Fanconi Anemia Research Fund, the gene responsible for causing the disease had been identified. Now all they needed to do was raise the massive amounts of money researchers would need to proceed with human trials for genetic therapies aimed at curing FA. Phil Knight&apos;s money had brought that goal within reach. Each year, around Christmas time, the Nike billionaire added to the Frohnmayer family&apos;s holiday cheer with a gift of $1 million to the Fanconi Anemia Research Fund; some years, he even gave $2 million. Things were different, however, in the final months of 2000. Even as Frohnmayer worked tirelessly to repair the damaged relationship between Nike and the University of Oregon, Knight made it clear that he would not be making his annual contribution to the Fanconi Anemia Research Fund. A dark, distressed mood fell over the Frohnmayer household, according to Golden, who was so shocked by Knight&apos;s cruelty that he wrote a letter to a University of Oregon faculty member who had been openly critical of the school&apos;s relationship with Nike. Early in 2001, over coffee, Golden unburdened himself: Dave was distressed, he said, and Lynn seemed to be on the verge of a nervous breakdown. Frohnmayer had never seen such cold, calculated wrath from Knight. 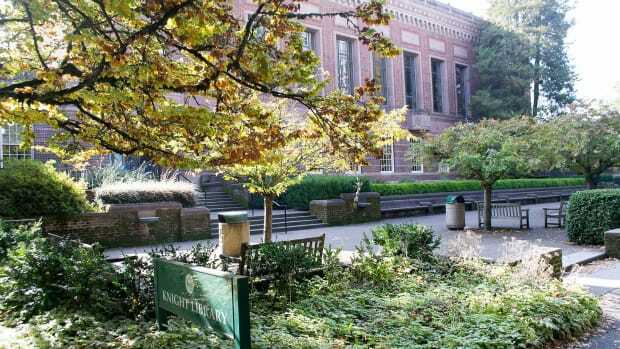 The extent of the personal considerations Knight seemed to expect in exchange for his financial gifts to the University of Oregon also surprised Frohnmayer. The disastrous fallout from the signing of the WRC agreement was, in many ways, a wake-up call for the university president, who suddenly realized he&apos;d been laboring for years under some serious delusions about the nature of the bargain he’d made by taking Knight&apos;s money. One of these delusions, he later wrote, was believing that Knight was someone who wanted merely to be informed on university matters, rather than to be consulted on them. Throughout the protests and negotiations surrounding the school&apos;s WRC membership, there had been communication between staff at the university and staff at Nike, and this, Frohnmayer assumed, was as much as any booster, however generous, could expect from a university president. But Knight turned out to be less a booster than a businessman in his dealings with the university, with expectations commensurate to the scale of the investments he&apos;d made in his alma mater. "If I had to do it over, I would have given him a courtesy call to make sure he knew how things were proceeding," Frohnmayer said. "I did not do that, and my regret is enormous." Equally enormous was the scale of panic spreading through the campus community and every other corner of Eugene, a town reliant on the university, more than any other institution or industry, for jobs. Knight&apos;s cancellation of a $30 million gift toward a planned renovation of Autzen Stadium was disastrous, but the prospect of losing his patronage completely was nothing short of an existential dilemma for the school: Since the 1995 Rose Bowl, Knight had funded not only athletics facilities but also renovations and expansions of libraries and other crumbling buildings on campus, as well as scholarships, professorships, and endowed chairs of departments. Meanwhile, the average student-loan debt and tuition were rising each year, while enrollment and funding from the state continued to plummet. The University of Oregon had come to depend on Uncle Phil, and without him the school&apos;s future seemed bleak. The prospects for finding an FA cure within Amy Frohnmayer&apos;s lifetime were also much dimmer without Knight&apos;s millions of dollars in gifts, the absence of which meant the Fanconi Anemia Research Fund would only raise half the money in 2000 that it had the previous year. Golden was so angry over Knight&apos;s decision, which seemed to him needlessly cruel, that he couldn&apos;t resist going behind Dave and Lynn&apos;s back to reveal the Nike billionaire&apos;s secret. Dave, however, did his best to remain composed and think strategically. Whatever happened, he would be called on to make a number of tough decisions regarding the school&apos;s future. The first decision Frohnmayer needed to make was the one that was on the minds of anyone even remotely involved with the university, the anti-sweatshop movement, or the Nike corporation: Was it time for the school to sever ties with Knight and build an alternative funding model? Or was it time to send the Nike chief executive a clear message that he would get nothing less than exactly what he wanted out of his relationship with the University of Oregon from now on? Compromise was impossible. Earlier in his career, Frohnmayer had served three terms in the Oregon House of Representatives, and he&apos;d spent a decade as the state&apos;s attorney general. When he applied his considerable political acumen to repairing the school&apos;s relationship with Knight, he did so with a delicate touch. It began in the weeks and months after the fallout of the WRC agreement, as Frohnmayer and Knight conversed "soul-searchingly," if sporadically, about what had happened and what could be done about it. "The bonds of trust" between the University of Oregon and Nike, Knight said, had been "shredded." But Frohnmayer felt, after a few conversations with Knight, that they could be repaired in time. There was no turning back the clock on the signing of the WRC agreement, but with some help from a Nike insider, Frohnmayer thought he might be able to find some way of doing the next best thing. Frohnmayer knew how much Knight had relied on Jill Ker Conway&apos;s advice when it came to issues like sweatshop labor and the student protest movement. She had joined Nike&apos;s board of directors in 1987 after being recruited by Knight himself, making her one of two board members who weren&apos;t, in her words, "either relatives of Phil&apos;s or people who had helped him sell things out of the back of his father&apos;s car to get the company going." It was the tail end of Nike&apos;s start-up years, when the company&apos;s revenues were soaring higher with each passing financial quarter, and Ker Conway proved to be a valuable, proactive member of the team, a corporate insider who could see the company with the discerning gaze of an outsider. This proved to be especially useful when international news organizations began documenting and widely publicizing the abhorrent conditions faced by workers making Nike shoes in factories based in Indonesia and Vietnam. So when Frohnmayer found himself wanting to get back in Knight&apos;s good graces, while also getting out of the WRC agreement he&apos;d signed, he felt she was the best person to advise him. Knight agreed, and asked Ker Conway to become an "unofficial liaison" between Nike and the University of Oregon, "to keep the lines of communications open." After meeting with Frohnmayer in person for the first time, she told her colleagues on the Nike board that she liked him very much, and intended to further the dialogue with him and the University of Oregon. Finally, after several months of brainstorming, an idea came to Frohnmayer after he discovered a newspaper article in the October 3rd, 2000, edition of the Eugene Register-Guard: "Miller Quits Workers Rights Board," the headline read, with the following summary just below it: "California lawmaker says the potential for ethical conflicts led him to step down, though he supports the group." Frohnmayer clipped the article, which reported U.S. Representative George Miller&apos;s decision to step down as chairman of the WRC, citing House ethics rules that complicated his relationship with the group. In the article, Miller reiterated his support of the WRC and its mission, signaling his full support for human rights even as he disassociated himself with the organization. It was just the kind of tightrope Frohnmayer had been looking to walk across. He had his secretary fax the newspaper clipping to Ker Conway, made some phone calls to his friends at the Oregon State Board of Higher Education, and spoke to the university&apos;s general counsel, Melinda Grier. It took less than a week for Grier to produce the document Frohnmayer had asked for, in part because he&apos;d been specific enough that he could have easily authored it himself, had the appearance of propriety not been so important. It was a simple letter of opinion raising a number of legal questions about the university&apos;s agreement with the WRC and formally advising the president not to pay any further dues it owed the labor organization. On October 25th, Frohnmayer made the decision public, saying that the school would no longer pay the dues necessary for membership in the WRC. Consistent with [the Oregon University System&apos;s] OUS&apos;s commitment to the free flow of commerce and efficient business practices, OUS institutions shall not adopt limits on eligibility to enter business agreements or otherwise conduct business unless based on the ability to perform, evidence of illegal activities or other criteria required or allowed by statute or Board rule. OUS institutions shall report compliance with this policy no later than December 31, 2001. It came just in time for those who wanted the University of Oregon to leave the WRC: a faculty senate ad hoc committee on trademark licensing and monitoring of factories was leaning toward recommending further research on Nike&apos;s use of overseas labor, which might have led to a longer relationship with the WRC. Instead, the University of Oregon&apos;s general counsel confirmed that the motion prevented the school from having an agreement with either the WRC or even the less stringent Nike-affiliated FLA. A few weeks later, on March 6th, 2001, Frohnmayer clipped another Register-Guard article and faxed it to Ker Conway: “UO Will Break Ties With WRC,” read the headline, beneath which an article cited a state policy prohibiting the school&apos;s membership in the anti-sweatshop group. The article cast Frohnmayer as a passive participant who did little more than accept general counsel Melinda Grier&apos;s determinations, which, in reality, he had conceived and all but drafted, along with the Oregon State Board of Higher Education&apos;s motion. Before faxing the article to Ker Conway, Frohnmayer scrawled a personal note across the top of the page, thanking the Nike insider for her "wise counsel." Arthur Golden told just a few people how far Phil Knight had gone to teach Dave Frohnmayer a lesson, and those few people kept the secret mostly to themselves. Nathan Tublitz was among them. "Those of us who heard about it thought it was outright extortion," Tublitz said. "But we kept our mouths shut because we felt terrible for Dave Frohnmayer and understood what he was going through. It was like there was a loaded gun pointed at his child&apos;s head." When Knight returned to the fold at the University of Oregon, he was welcomed as a returning hero, not a villain. There was, however, a strange, almost superstitious lack of fanfare; the strings were now visible for all to see, even if Knight and Frohnmayer were the only ones who knew exactly how the puppet show worked. The spring semester passed quietly, but by summer break it was clear that the old lines of communication between Nike executives and university administrators were crackling back to life. In early August of 2001, the school displayed renewed financial confidence as it broke ground on the expansion of Autzen Stadium, which had been stalled for a year after Knight withdrew his promised contribution of $30 million. Then, in September, the Nike chief executive announced publicly what Frohnmayer had known for months: his commitments to the University of Oregon, financial and otherwise, had been renewed. Knight&apos;s money quickly breathed new life into the stadium expansion, which had become saddled with ballooning costs necessary to make up for lost time and finish the job before the 2002 college football season. Instead of a projected $80 million price tag, the expansion would cost $89 million, plus unforeseen extras, like $1.3 million worth of brand-new artificial turf that had to be replaced after it proved to be too slick in the rain. Instead of the original $30 million pledge, Knight would pay nearly twice that sum toward the stadium expansion, while the remaining $29 million was funded by issuing state bonds that came with hefty interest payments. What wasn&apos;t covered by state bonds or Knight&apos;s money were the various operating costs—like the $2 million that Oregon&apos;s athletic department siphoned from the school&apos;s general fund each year—that got passed on to students whose tuition dollars replenished the fund whether they liked athletics or not. While the University of Oregon&apos;s top administrators scrambled to cobble together $90 million to improve the school&apos;s football stadium, its faculty was earning less than their contemporaries at each of the 61 universities in its cohort of similarly prestigious public research institutions. "Coughing up $90 million to build luxury skyboxes when you can&apos;t pay faculty is a form of insanity," said Jim Earl, who had become one of Knight&apos;s most vocal critics on campus. The $90 million makeover that began in August of 2001 sparked both great hope for the football program&apos;s future and great anxiety over the school&apos;s priorities. There was a growing mistrust, throughout the nation, of the motives behind universities that had ostensibly sought to use college athletics as a tool for recruiting students and attracting donors in order to support its academic and research programs. Tublitz called the exponential growth of college football programs "a time bomb," built on an unsustainable model, which, he added, was "spiraling out of control financially and morally." The University of Oregon, Frohnmayer claimed, had no intention of plunging its athletics department into "an arms race that&apos;s not sustainable except for the five or six more successful, richest institutions." In reality, the school was not only engaged in such an arms race, but leading it. Evidence of this could be found as close as Autzen Stadium and as far away as Manhattan, where the school had spent $250,000 on a massive 80-by-100-foot billboard to promote Oregon&apos;s star quarterback, Joey Harrington, as a candidate for the 2001 Heisman Trophy. Then there was Oregon Ducks head coach Mike Bellotti, who led the team to a record 10 victories in 2000, earning him a $750,000 salary with escalator clauses that made it possible for him to bring in $1 million per season. 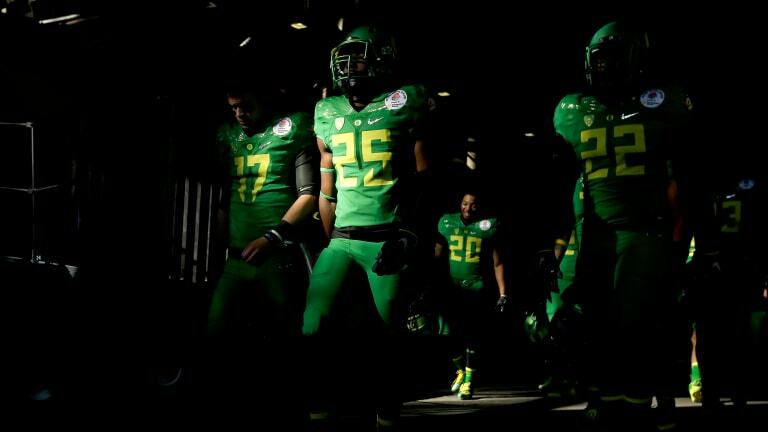 Just as Nike had become the national face of concerns over sweatshop labor, Oregon&apos;s football program suddenly became the focus of those concerned that academics had become secondary to athletics at a number of American universities. Tublitz was cautiously optimistic that the athletic department would make good on its promise to become financially self-sufficient by 2004, but many of his colleagues held the more pessimistic view that Oregon&apos;s football program, which had been a punch line only a decade earlier, had grown into a juggernaut that would consume more resources, not fewer, as it grew. As these concerns over out-of-control spending became more urgent, Frohnmayer summoned increasingly grandiose defenses to quell faculty protests. "We don&apos;t want to become a pseudo-professional team," he said. Pseudo-professional was, however, an apt description for what Oregon football was becoming: ticket revenues increased by $2 million annually after Autzen&apos;s expansion and face-lift; conference payouts for the right to broadcast Oregon football and basketball games brought in another $10 million each year; and with Knight&apos;s return came a cavalcade of Nike marketing executives, designers, and branding specialists who descended on the University of Oregon campus to discuss new deals, projects, and partnerships. The key partnership remained, as ever, between Frohnmayer and Knight, who quietly finalized a deal one year in the making, recorded in the Fanconi Anemia Research Fund&apos;s 2001 tax filings as an "unusual grant" of $2 million, which, filings state, came from the same individual who donated $2 million to the organization in 1999—a donor who, conspicuously, had not offered a donation in 2000. And that donor, according to Lynn Frohnmayer, had been Phil Knight. In the years since Frohnmayer hired him to be the University of Oregon&apos;s director of communications, Tomas Hager had rarely been surprised during the course of his workday. His job, after all, was to make sure that the media and the public knew what was going on at one of the state&apos;s oldest liberal arts universities, which made Hager and his small staff arguably the most informed people on campus. This made it especially shocking when they were corralled into a conference room one day in the spring of 2001 and introduced to a team of Nike designers who had been working in secret on a new brand identity and logo for the Oregon Ducks. "I was surprised about the unveiling of the new logo as a sort of fait accompli," Hager said. "Supposedly I was in charge of external communications for the university and I had not been privy to any discussions about changing things." Hager had been excluded from the process for the same reason that virtually every other university employee found themselves out of the loop: Nike was now calling the shots on campus. The mingling of public and private labor had been a growing problem since the late &apos;90s, when Nike employees began consulting on various projects alongside university employees, who were ostensibly employees of the state. 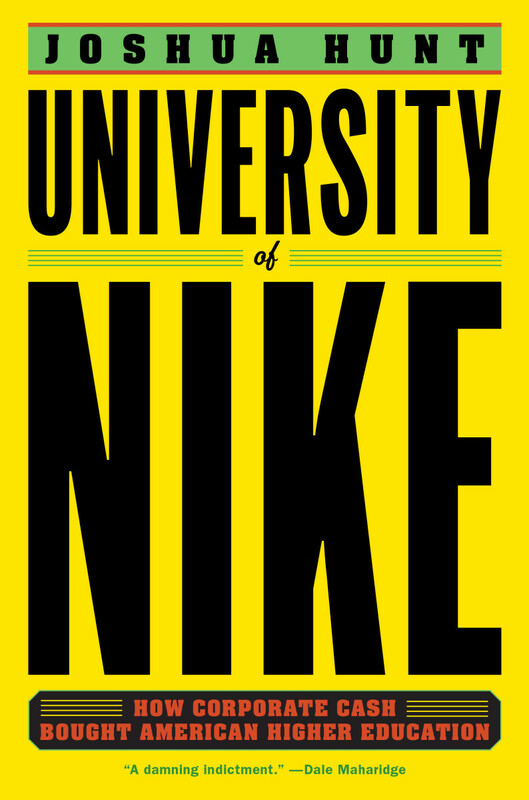 With its rebranding project, Nike established a new precedent, which was to compartmentalize some aspects of its partnership with the university to such an extent that faculty, staff, and student involvement were almost eliminated. Nike&apos;s Gulfstream V corporate jet became a veritable fixture at the Eugene airport, while Nike "suits" became a regular presence on campus. When they showed up in your department, Hager said, you learned to stay out of their way. Whatever they came to do was subject to little or no scrutiny, since Nike is not subject to the same level of accountability as a public university; this lack of transparency, meanwhile, made it more difficult to discern which decisions were being made by Frohnmayer and which were being made by Knight. "At some point the decision was made to let athletics have their own media people," Hager said. "One or two of them at first, and more when the money started rolling in, all of them in the habit of handling their own requests their own way, with an emphasis on the marketing." Hager fought to bring the university&apos;s office of communications back under one roof, but it went nowhere, leaving the school with parallel media relations operations beholden to different stakeholders. 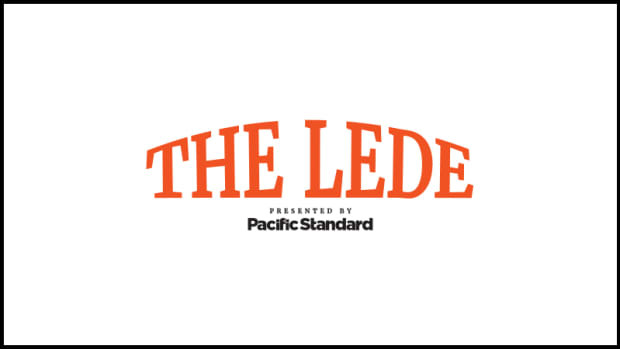 The athletics department&apos;s public relations staff, with its emphasis on marketing and obfuscation, grew increasingly powerful as it aligned itself with marketing executives and public relations specialists from Nike. It was the school&apos;s new logo and brand identity, however, that signaled a turning point for Hager. "After that there was a different way of doing things," he said. This story was adapted from Joshua Hunt&apos;s University of Nike: How Corporate Cash Bought American Higher Education, which will be published by Melville House on October 23rd. The book is available for pre-order now. Joshua Hunt is an author and journalist from Petersburg, Alaska. His work has appeared in The New Yorker, the New York Times, Bloomberg Businessweek, and other publications. Previously a Tokyo-based foreign correspondent for Reuters, he has reported from Japan, China and Hong Kong, India, Tanzania, Kenya, and throughout the Americas. Laura Hanson says University of Oregon attorneys obtained her counseling records without her permission. The university says it did nothing wrong, but has since changed its policy. A collection of some of our most important and timely stories, from an investigation into Nike's control over the University of Oregon to a profile of Canada's Desmond Cole. Higher education in the United States rules the world. What's wrong with it? 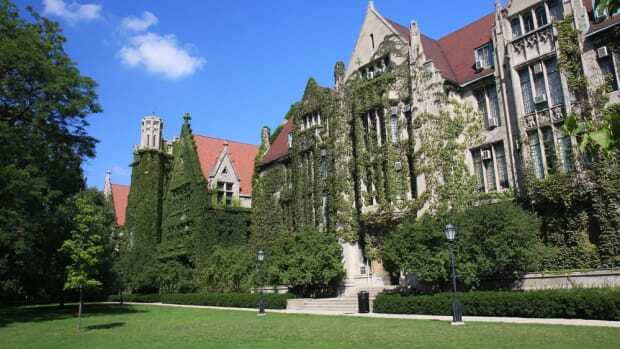 Members of the University of Chicago Police Department carry guns, make arrests, and patrol tens of thousands of residents unaffiliated with the university—but they don’t have to disclose any information about stops, arrests, and policies. Two Illinois Representatives are finally trying to change that.